Butler point guard Mia Rader drives against Knoch's Hannah Rowe during the championship game of the Butler holiday tournament. The Golden Tornado topped the Knights, 40-25. BUTLER TWP — Butler didn't just close the door on Knoch, the Golden Tornado slammed it shut. Holding a modest 28-24 lead after three quarters of the championship game of the Butler Girls Basketball Christmas Tournament, the Tornado completely dominated the final eight minutes. 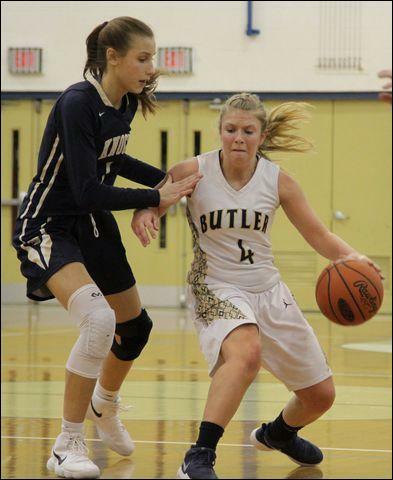 Butler made its first nine attempts from the free throw line in the period, out-rebounded the Knights 7-3 and didn't give up a field goal in a 40-25 victory. Tornado senior Jenna Kunst hit a 3-pointer with 6:38 left in the game, pushing her team's lead to 31-24. It was the fourth straight victory for Butler (5-3) while Knoch (3-5) saw its 3-game winning streak snapped. Knoch scored just a single point in the fourth quarter — Emily Fraser's free throw moments after Kunst's trey. Turnovers hurt the Knights, who attempted just five field goals in the period. “Butler did a good job of picking up their pressure on the ball and we did not react well to it,” said Knoch coach Chris Andreassi. Free throws helped the Tornado ice the game. Alyssa Eyth was 4-of-4 in the fourth quarter, Kunst was 3-of-4 and Mia Rader 2-of-2. The Knights' troubles began in earnest in the third quarter. The team's offense slowed to a trickle with five turnovers and just two made field goals. Knoch proved to be the better team early, allowing just five first-quarter points to Butler on 2-of-13 shooting. The Tornado were just 1-of-10 from beyond the arc in that span. “Knoch's 1-3-1 zone was effective and I think we settled for some of those 3-pointers early,” said Maier. The Knights began to struggle offensively in the second quarter, but Fraser's trey with 10 seconds remaining in the first half gave Knoch a 19-16 halftime edge. Kunst led all scorers with 15 points, 13 in the second half, and chipped in five rebounds and five steals. Fraser scored 12 points for Knoch, 11 coming in the first two quarters. Butler gets a break from game action and won't play again until a section meeting at Shaler next Thursday. Knoch hosts a non-section game against Shady Side Academy on Tuesday before hosting section foe Freeport next Thursday. Note: In Thursday's consolation game, Indiana scored a 45-35 win over Allderdice. Hannah Rowe 1 0-0 2, Kayla Grafton 1 0-0 2, Gabby Fennell 1 0-0 3, Emily Fraser 4 1-2 12, Casey Kretzer 1 1-4 3, Skylar Burkett 1 0-0 3, Anna Neff 0 0-0 0. Totals: 9 2-6 25. Mia Rader 0 3-4 3, Alyssa Eyth 2 5-6 9, Jordan Kauffman 1 0-0 3, Emma Monteleone 1 0-0 3, Jenna Kunst 5 3-4 15, Julia Gibson 1 0-2 2, Emilee Altman 1 0-0 3, Heidi Gross 1 0-0 2, Nicole Pepmeyer 0 0-0 0, Morgan Gage 0 0-0 0. Totals: 12 11-16 40. 3-point goals: Knoch 5 (Fraser 3, Fennell, Burkett); Butler 5 (Kunst 2, E. Altman, Monteleone, Kauffman).